NES Wizardry: Proving Grounds of the Mad Overlord (USA) in 00:45.82 by TaoTao. One of a few dungeon crawlers on this site. 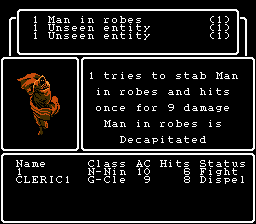 The player's team of a couple characters travels through a dungeon at breakneck speed, obtaining the minimum necessary to destroy the evil wizard, then leaving. A great amount of luck-manipulation was required; so much that TaoTao used a bot to do parts of this run. That's why the rerecord count says 200000. The number of manual rerecords is around 1000.